As a key gateway linking Asia and Europe, Dubai is well positioned to help Cainiao achieve its goal of 72-hour global delivery. 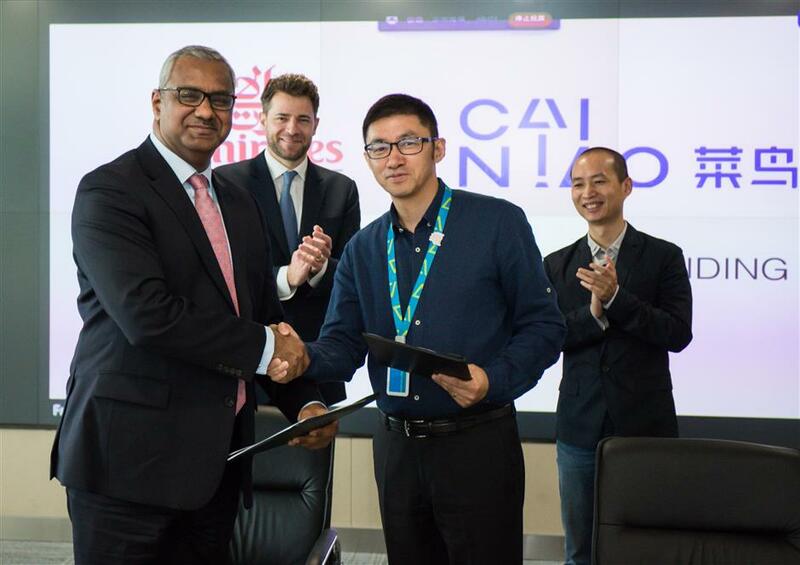 The MoU is signed by Nabil Sultan (left), Emirates divisional senior vice president, cargo, and Guan Xiaodong, general manager of Cainiao Global Business at the Chinese logistics firm's headquarters in Hangzhou. Cainiao Network and Emirates’ SkyCargo said on Wednesday they signed a memorandum of understanding to set up a digital trade transfer hub at Dubai airport to help cargo transfers in the Middle East. The logistics hub will serve as a connecting point linking Africa, Europe and Asia. The two parties seek to leverage their strengths in cross-border e-commerce trade and airline cargo operation. Dubai is one of the six global hubs that Cainiao plans to develop and the firm has pledged recently to invest hundreds of billions of yuan to upgrade smart logistics infrastructure. “As a key gateway that links Asia and Europe, Dubai is well positioned to help us achieve our goal of 72-hour global delivery," said Guan Xiaodong, general manager of Cainiao Global Business. "The MoU with Emirates SkyCargo is another milestone to reach this goal." Cainiao "is strongly committed to Dubai and the neighboring markets and this fits well with our broader strategy," Guan added. Under the MoU, Emirates SkyCargo and Cainiao will work closely to manage e-commerce shipments in the Middle East and other neighboring regions through Dubai as the Alibaba Group’s logistics affiliate looks to expand its global logistics infrastructure with Dubai as a hub. Cainiao Network now links with 32 major airlines which connect to more than 40 countries and regions.